Apple’s Mac OS X and iOS send your Spotlight searches over the Internet to Apple. You then see results from Bing and suggested websites, locations, and media content. You can disable this and keep your searches entirely local, whether you’re using Spotlight on a Mac or iOS device. If you have Location Services enabled on your Mac or iOS device, your current location will also be sent to Apple when you search via Spotlight. This allows Apple to provide location-specific results. If this bothers you, you could continue using Spotlight’s web search results without sharing your location. To change Spotlight settings on Mac OS X, click the Apple menu and select System Preferences. Click the Spotlight icon in the System Preferences window. Uncheck “Allow Spotlight Suggestions in Spotlight and Look up” at the bottom of the window, and uncheck the “Bing Web Searches” option in the list. 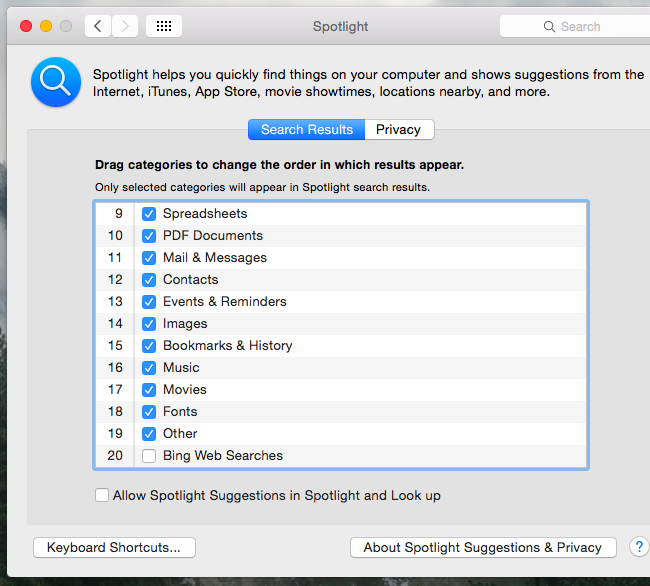 After you disable these features, Spotlight will only search local files and other data on your Mac itself. It won’t send your searches over the web to Apple or show you web-based results. These options affect the Spotlight search feature that appears when you press Command + Space or click the search icon near the right side of the menu bar on the top of your screen. If you’d like to keep using Spotlight search suggestions, Bing web results, or both without the location-specific data, you can choose to disable Location Services for Spotlight. To do this on a Mac, open the System Settings app and click the Security & Privacy icon. Click the lock icon here and enter your password. Click over to the Privacy tab, select Location Services, scroll down, click the Details button next to System Services, and uncheck the “Spotlight Suggestions” option. Spotlight won’t be allowed to access your location and send it to Apple anymore. 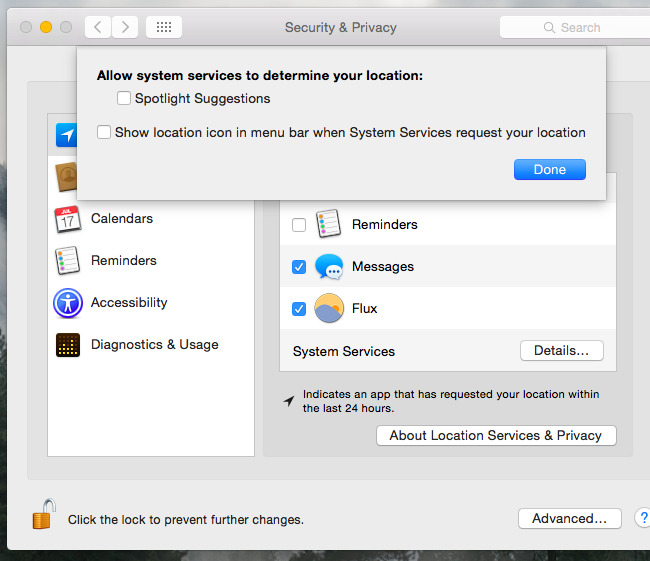 You can also prevent your iPhone or iPad from sharing your location with Spotlight and thus Apple’s servers. Do this and you’ll still be able to use web search results — but without the location-specific perks. 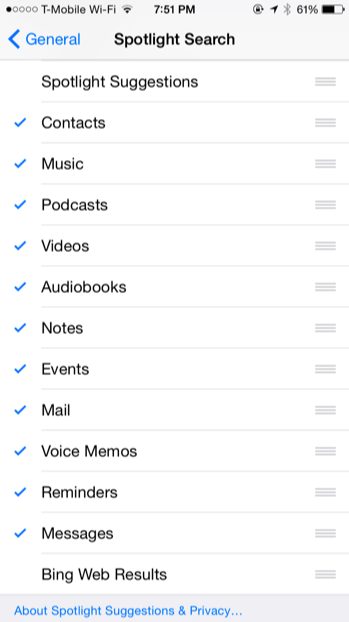 To access this setting, open the Settings app, select Privacy, and tap Location Services. 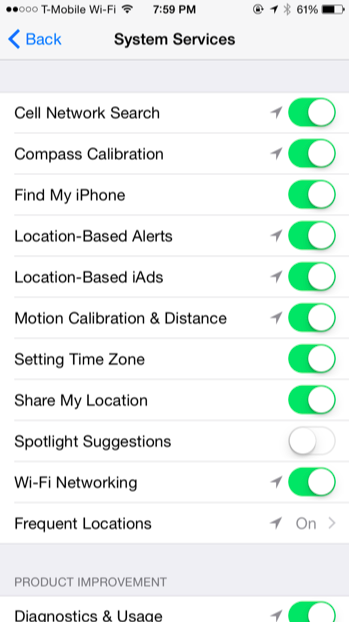 Scroll down and tap System Services at the bottom of the list of apps with permission to access your location. Disable the “Spotlight Suggestions” option here. Modern operating systems love sending your system searches over the web and returning search results, and Apple’s are no exception. Windows 10 does this with Cortana, Windows 8.1 does it with Bing, Android does it with Google — even Ubuntu does it.